In this essay we consider why American colleges and universities participate in big-time commercialized intercollegiate sports, and how sports came to play such a prominent role on American college and university campuses. 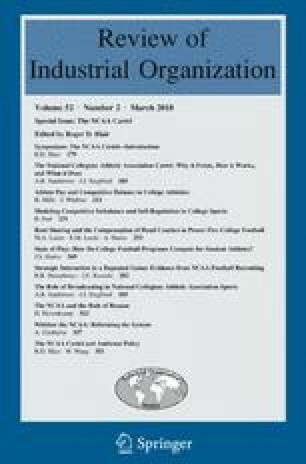 We also review how the National Collegiate Athletic Association (NCAA) developed as a body to regulate player safety and transformed itself into an economic regulator, the means by which the NCAA attempts to maintain its control, increase revenues, and reduce costs for college sports programs. We also examine how the organization succeeds in the face of institutional characteristics that imply that its cartel activities would be doomed. Finally, we speculate on what changes might be on the horizon for the NCAA and college athletics. The authors acknowledge and thank their research assistant, Lindsey Currier, for her valuable contributions and Andrew Zimbalist and Lawrence White for helpful comments on an earlier draft.